A custom designed chrome or Black Chrome Dual Blade, Hum-Cancelling Stratocaster pickup for a noiseless take on the Classic Strat sound. I've spent a great deal of time getting these hum-cancelling Strat Pickups just right, spending hours on test & prototype versions before deciding on the final design. I tried dummy coil pickups as an alternative to blades but ultimately, the design just wasn't for me, just couldn't get the clarity and definition I wanted - Would've loved for the hidden, dummy coil design to work but ultimately, the blade design, for me, gives the potential for a much clearer, more defined and ultimately more versatile hum-cancelling pickup. I use thinner 43AWg Plain Enamel wire which allows me to build a good size coil around each steel blade, offsetting the coils with a looser scatterwound pattern to helps keep a richer tone as I found that too tight, too close a similarity between the two coils gave more of a sterile sound for me. The trick is to balance the coils so they keep a richer tone without losing the hum-cancelling quality of the dual blade design. It took a while to decide on a final specification but it was worth the time and effort to arrive a pickup I was happy with. 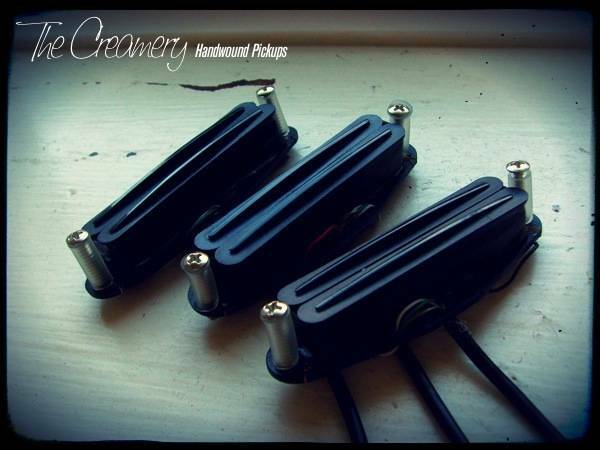 Available in either my custom Chrome Plated or Black Chrome Plated steel blades, the pickups are wound with thinner 43AWG wire to seemingly higher outputs but in reality they're on a par, in terms of perceived 'volume' or 'loudness' with my Sweet '74 pickups but if you'd like a lower output more akin to the classic '60s Strat tones then just let me know and I'll make a custom wound version, no problem.